Over the past three years, the emergence of the South American economy has not been a surprise to many. While Brazil may be the first country that comes to mind when one mentions a strong South American economy, other countries such as Argentina, Uruguay, and Colombia will start to make more headlines over the next two to three years. After all, their respective GDP growth rates on a year-over-year basis are the three highest in South America at 9.30%, 8.47%, and 7.7%. From an M&A standpoint, in these countries combined, there were 42 more deals announced or closed in 2011 than there were in 2010. The associated transaction values jumped by $3.6 billion. 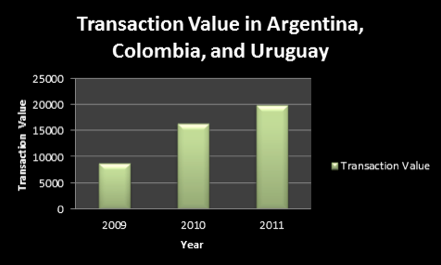 In terms of the increase in number of transactions and the aggregate increase in transaction value, both increased by 22% from 2010 to 2011. Furthermore, almost 60% of all deals occurred in one of the four following sectors: Energy, Financials, Materials, and Industrials. 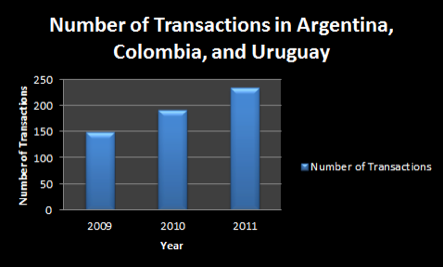 With strong macroeconomic factors, we expect M&A in these and other South American countries to continue the upward trend in 2012. Additionally, as more and more companies worldwide begin to see the tremendous growth opportunities that these countries present, the number of transactions should continue to increase every year.